Unstoppable is a look at Genesis from the Bible and gives some thought to the idea that God is really there for you, even in the midst of a tragedy, even in the midst of suffering. I truly enjoyed this movie--but I am a Bible believing Christian. Hearing the testimonies of those in the film who have faced suffering and tragic events was incredibly moving. Make sure you have some tissues ready for this movie. I thought the film was a powerful testimony to the fact that God is there, even if a tragedy comes our way. I can imagine that atheists and people of religions that do not recognize Christ will not be as interested in this movie, which is too bad. I think we can all learn something new about others when we learn about their religion. It gives you insight into the heart of the people. So I would encourage those of every faith to take a risk at learning about others and seeing this movie. ABOUT UNSTOPPABLEInspired by the death of Cameron’s close friend who succumbed to cancer at the age of 15, Kirk Cameron takes viewers on an inspiring and hope-filled visual journey to better understand the biggest doubt-raising question in faith: “Where is God in the midst of tragedy and suffering?”Going back to the beginning—literally—Kirk investigates the origins of good and evil and how they impact our lives … and our eternities. 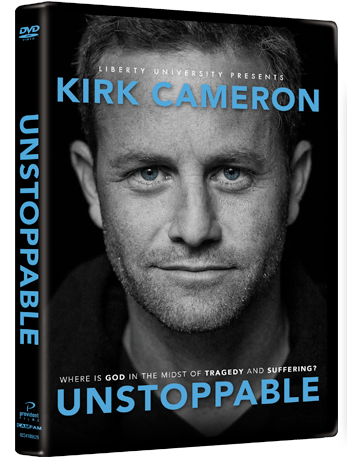 UNSTOPPABLE will prompt audiences to consider the role that pain and suffering has in our lives, as they affirm their personal views on faith, and encourage conversation starters about God, suffering, and hope. One of my readers will win a copy of UNSTOPPABLE. Giveaway is open to US and Canada. Disclosure (in accordance with the FTC’s 16 CFR, Part 255: Guides Concerning the Use of Endorsements and Testimonials in Advertising): Many thanks to Propeller Consulting, LLC for providing this prize for the giveaway. Choice of winners and opinions are 100% my own and NOT influenced by monetary compensation. I did receive a sample of the product in exchange for this review and post. Honestly, I just like Kirk Cameron....his whole family is incredible! It was put on DVD after a one night showing! I love that this is so personal. I like that it tackles a tough question. I would love to see the DVD! It tackles tough questions. I like the Camerons. I've asked myself before "Where is God in my suffering?" I can't wait to see this movie! Unstoppable, like Fireproof, takes our minds to a God-centered place that we all need to come back to. Can't wait to see this Kirk Cameron epic! I learned you could get a license to show the movie in your church. Sweet! I learned how God-centered it is!! Empowering! WHY? We all ask why...I am just glad I know I can ask why and know I will be shown or told in one way or another. I learned that Liberty University is the largest private, nonprofit university in the nation, the largest university in Virginia, and the largest Christian university in the world. Janet Parshall gave an endorsement. I learned that this movie is not a documentary but a personal journey and a story of hope. I learned that churhes can purchase a license to show the film. I had initially thought it was a documentary when it really isn't. Looks very good. I just like Kirk Cameron....his whole family is incredible! Kirk Cameron is so inspirational and family oriented. I love when he does these types of movies. I like Kirk's thoughts on God...he is always so open and honest. I like Kirk Cameron and I have a lot of respect for him and his beliefs - I would love to see this movie. I've been a fan of Kirk Cameron for years. I saw him in "Fireproof" and it was excellent. I would like to see this Documentary because it addresses the issues of Faith in God and why he doesn't do anything to help the suffering when he can do something. The DVD is endorsed by The Dove Foundation. I loved the movie Fireproof and can't wait to see this one. However I didn't realize how many other things hes involved in. I like that him and his wife started camp firefly for kids. I liked the videos and photos on the site. kristiedonelson(at)gmail(dot)com Thank you. I want to see this movie sooo badly. I love Kirk Cameron and I agree with his views. I learned that the dvd is available and that there are church showings too. I have really been wanting to see this movie, it looks so interesting!! I love all the movies with Kirk Cameron! I like how inspiring and meaningful this movie seems to be. It'd be great to watch a movie with such deapth and such a great message!